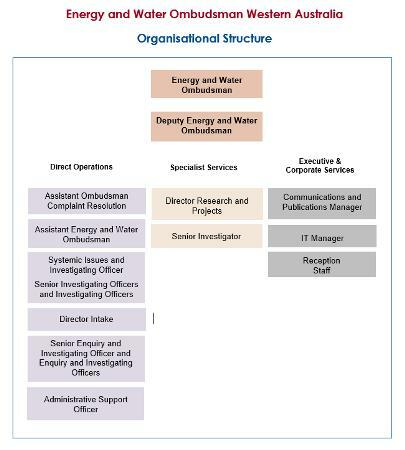 The Office of the Energy and Water Ombudsman Western Australia is located within the office of the Western Australian Ombudsman. This provides the opportunity to achieve significant benefits through scale and scope economies that would not be available to a very small stand-alone energy ombudsman scheme such as Energy and Water Ombudsman Western Australia. It also creates the opportunity for improved service quality delivery through the highly developed, specialised expertise existing in the office of the Western Australian Ombudsman. Direct operational dispute resolution services are provideds by a team of staff reporting to the Western Australian Ombudsman in his role as Energy and Water Ombudsman Western Australia. Specialist investigations services, as well as the review of disputed decisions, are provided for complex cases through senior investigation staff of the Western Australian Ombudsman’s office. Corporate services, including IT and communications, are provided through the Strategic and Corporate Services Division of the Western Australian Ombudsman.